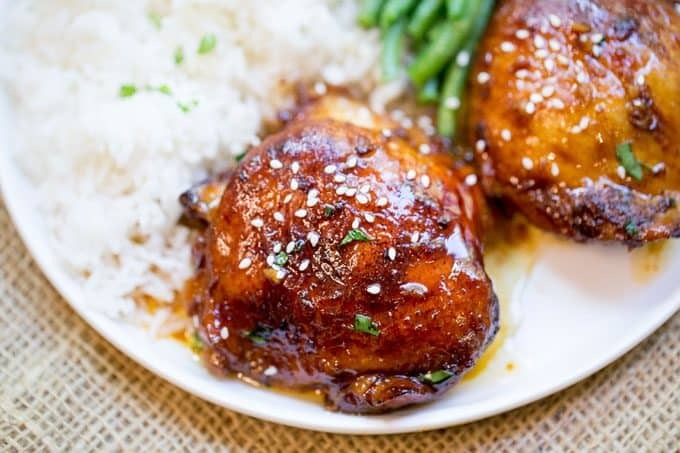 Slow Cooker Honey Garlic Chicken is the perfect weeknight meal with just five ingredients. Full of flavor and easy to make with pantry ingredients and almost no prep! 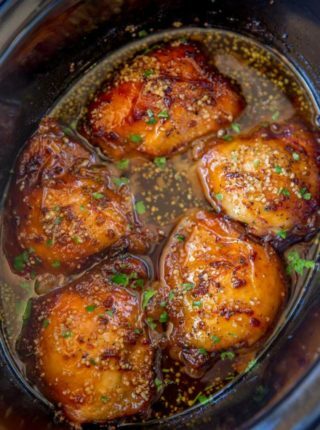 Slow Cooker Honey Garlic Chicken is the perfect weeknight meal that will be waiting for you when you get home and can be prepared even if you’re in a rush in the morning! You can also add the ingredients to a freezer bag and save it for later making this a perfect make ahead meal. 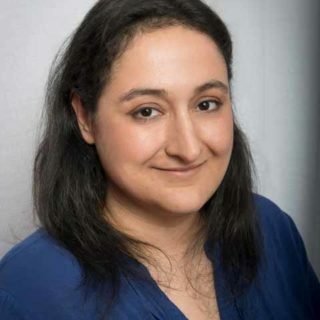 When I was pregnant with out first child I went through a crazy phase where I decided the entire deep freeze needed to be filled with enough meals to get us through the first six months of life with a baby. Enter slow cooker meals. The slow cooker seemed like the perfect cooking tool to get us through the rough times. 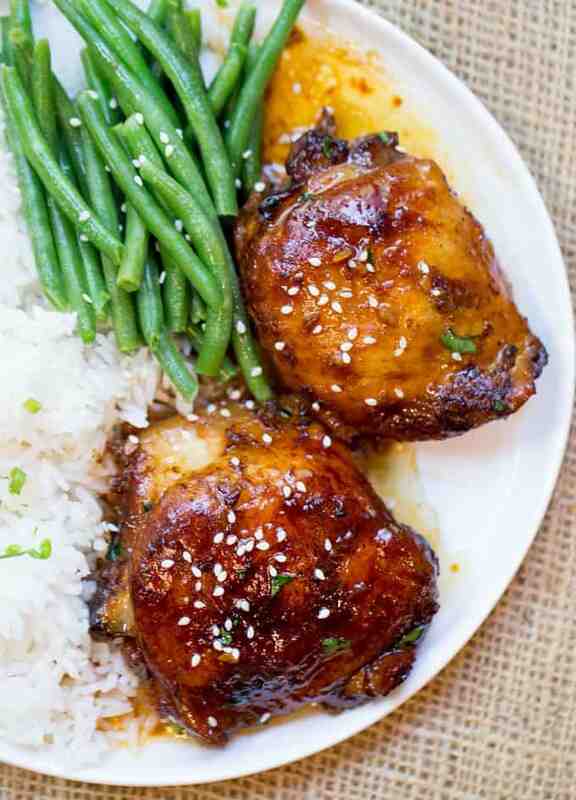 This Slow Cooker Honey Garlic Chicken became a staple in our house. 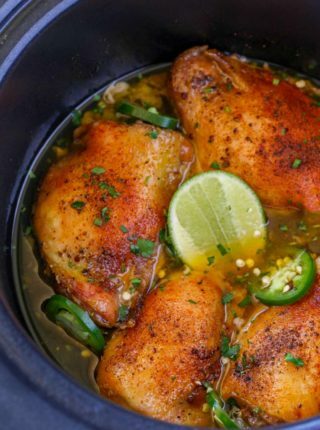 Slow Cooker Honey Garlic Chicken made with just the small amount of each ingredient listed leaves you with just enough liquid so the tops of the chicken can brown instead of becoming soggy and grey and the liquid left over (once you skim the oil off the top that the chicken has rendered off) is the perfect amount to spoon on top of your chicken. There is no need to pull out the cornstarch here, there’s no soupy water to thicken. 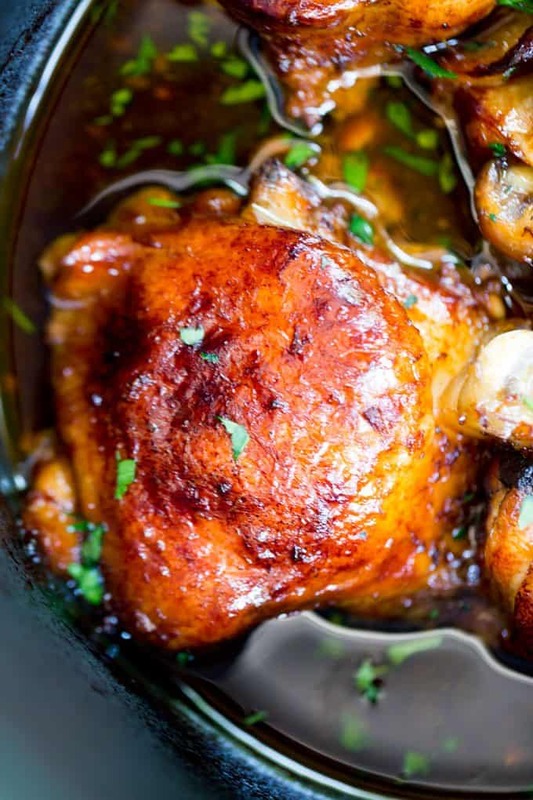 Just a delicious meal you can make even fancier with the addition of some parsley or sesame seeds to give the chicken a bit of color. For Making Ahead: If you plan to assemble and freeze the ingredients, you just add them to a freezer back and freeze flat for more even defrosting. When you are ready to cook, take the bag from the freezer and let it defrost for 24 hours in your fridge first. Then cook according to the directions in the recipe card. 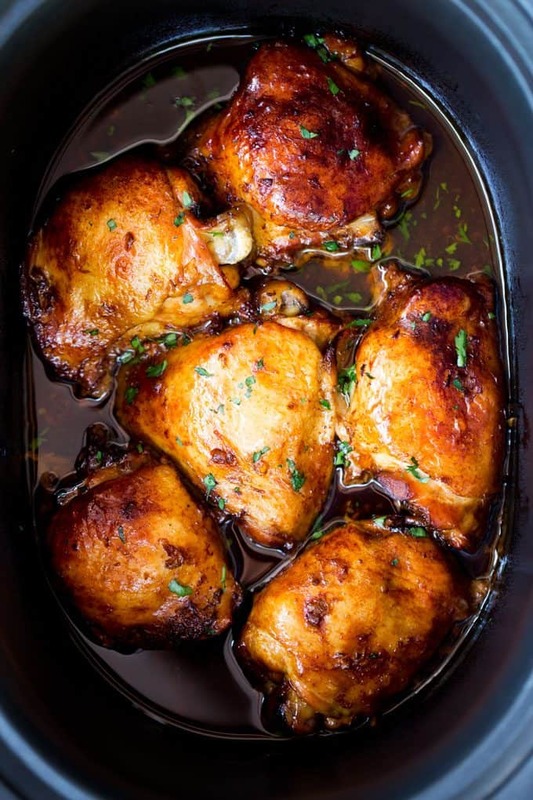 Slow Cooker Honey Garlic Chicken uses pantry ingredients you have in your cupboard at this very moment (except the chicken, but I mean…). Ketchup? Soy Sauce? Honey? Garlic? 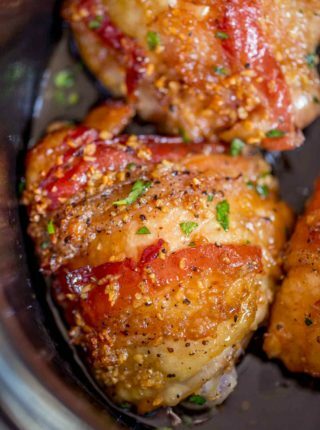 It doesn’t even take very much to make the Slow Cooker Honey Garlic Chicken delicious. I am a huge fan of cooking in your slow cooker with small amounts of liquid. Too often a recipe will call for significant amounts of added liquids and you end up with completely watery soup. Lite Soy Sauce: I am an admitted lover of salt but I don’t even own non-lite soy sauce. This is the one you want in your kitchen and if you use regular soy sauce expect that your result will be saltier. Freezer Bags: Other brands may be more popular, but I have never had a bag burst/leak with this brand. I have however with Ziploc. 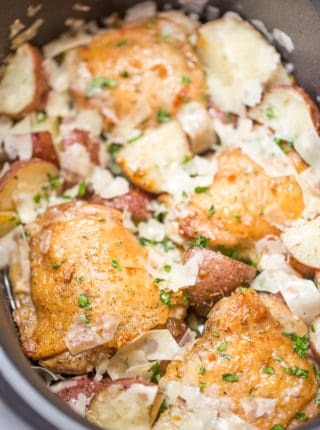 Combine all the ingredients together in the slow cooker until well mixed. Lay the chicken skin side up in a single layer and cook on low for 6-7 hours. If your chicken isn't browned on the top you can put it on a foil lined cookie sheet under a broiler for 2-3 minutes. 5 stars!!! Ibe made this now several times at least twice a month now for a few months!!! 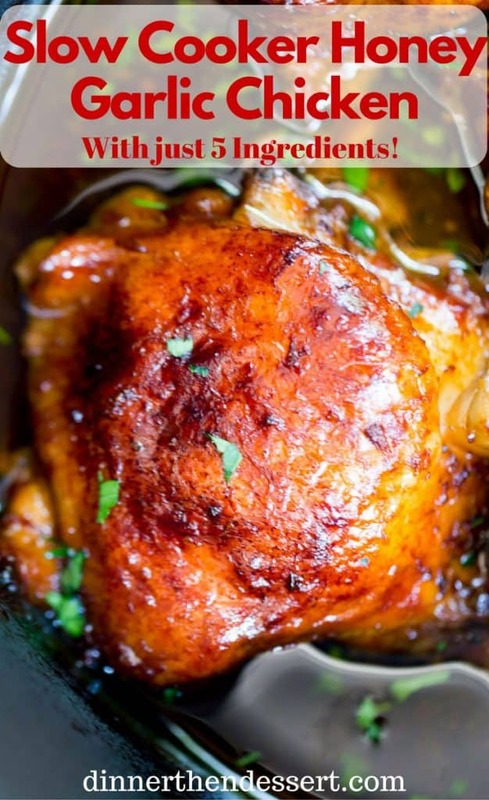 Its so easy and incredibly tender, moist, and delightfully delicious!!! Easy peasy and mine look just like the pictured ones!!! We have them served up over a bed of rice drizzled with a little sauce and broccoli! Has become a go to meal for us. I like that you can assemble everything ahead and freeze it for later use. Thank you will be making your whole chicke recipe next…have a really good feeling aboit it which I never would have had in the past!!! I made this today. Very easy to make and was absolutely scrummy. Made this twice now and was a big hit!!! 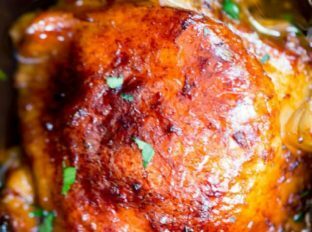 The chicken is so tender, moist, and scrumptious it’s become a go to in our house at least twice a month!!! Quick, easy, and insanely delicious!!! Served over rice or riced cauliflower (that’s want I used) with a veggie it’s an easy peasy delightful meal!!! Thank you for the recipe!!! You’re welcome, Debra! Thanks for coming back to let me know how much you’ve enjoyed it!